Taronga Zoo in Sydney, Australia, have welcomed a surprise new wallaby more than a year after the only male of the species was moved away. 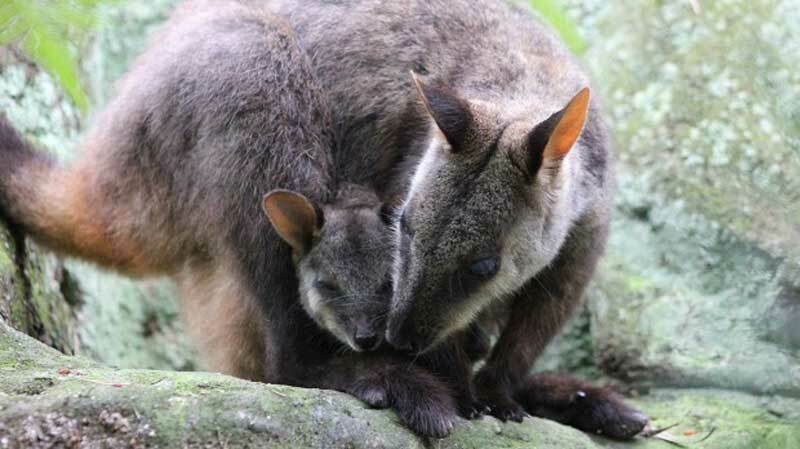 Mica, an endangered brush-tailed rock wallaby, was due for a well-earned rest after giving birth to a joey in March last year and carrying it her pouch for more than six months. However, when staff were caring for Mica, who is almost six, and her youngster in recent months they noticed there was more movement in her pouch. Wallaby keeper Tony-Britt Lewis said the zoo wasn't planning for another joey, so for Mica to have one was "quite a shock". Recently, the surprise (but welcome) addition made its first appearance, poking its head out of Mica's pouch and appearing to smile happily in the sunlight. It is in great health and appears to be around six months old, meaning it will soon venture out of the pouch and allow staff to discover its gender. Keepers believe Mica mated with the only male wallaby, Sam, shortly after she gave birth to her first joey in around March last year. She then stored the fertilised embryo away while she raised her existing joey, in a phenomena known as embyronic diapause. 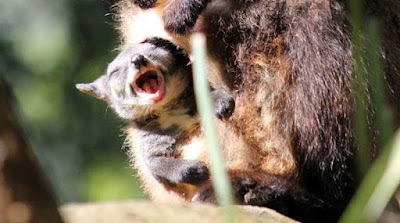 Tony Britt-Lewis said the process, which gives marsupials the ability to keep an embryo for several months before it is implanted, is useful in the wild. Keepers aren't yet sure of the joey's gender. 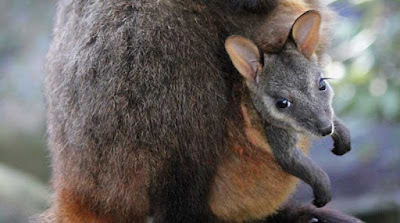 "It's an interesting survival mechanism that allows the mother to delay the development of the embryo in drought conditions or if she already has a joey in the pouch," Mr Britt-Lewis said. 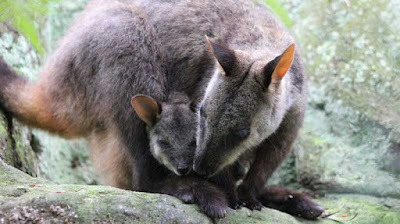 The joey adds to five brush-tailed rock wallabies that live at Taronga Zoo as part of a breeding programme. The species is considered endangered in NSW as a result of hunting in the 1900s and the destruction of their habitat. Under the tutelage of Mica, it's expected the joey will begin to explore its enclosure any day now. "It shouldn't be long before we start to see it venturing out of the pouch to take its first wobbly steps," Mr Britt-Lewis said. "Mica is a confident and attentive mum and her joey looks to be very strong." Uh, this is hardly what I'd call impregnating oneself. There was a father involved. Silly sensational headline. Still an interesting story, tho.